The first Monday Night Football slate of the new NFL football season meant it was double your pleasure for NFL fans across the nation. The Detroit Lions hosted the New York Jets in the first game of the night. Then the Oakland Raiders hosted the Los Angeles Rams to close out the action in Week 1. The two games gave us plenty of action. These are the biggest winners and losers from the two prime-time matchups. It’s a good thing that first impressions don’t always stick. Because if that were the case, then Sam Darnold’s first pass as a pro — a pick-six — would have doomed his career. The young man is nothing if not resilient, however. He bounced right back from that egregious faux pas and went right to work showing he absolutely has what it takes to lead an NFL offense. 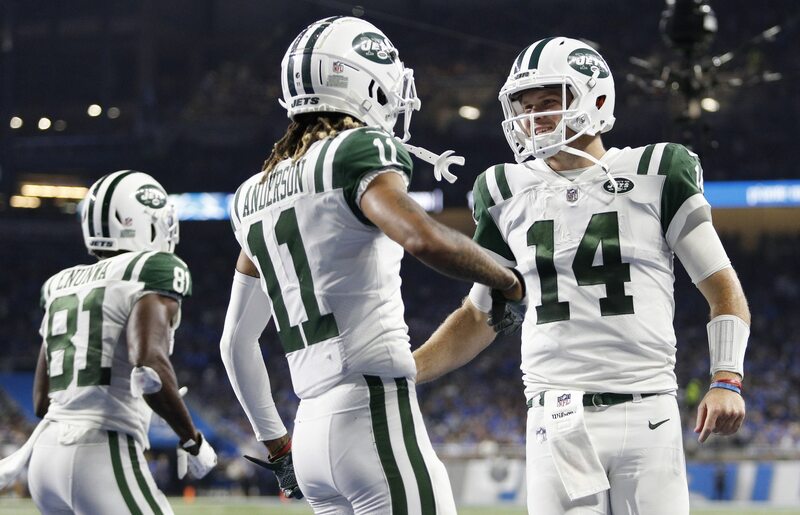 Darnold finished the game having completed 16-of-21 passes for 198 yards with two touchdowns and the lone interception. He was extremely poised under pressure and took what Detroit’s defense gave him. The Jets and their fans must be overjoyed at having finally found the answer they’ve been looking for the past few decades. We were very worried about Matthew Stafford this summer after watching his offensive line fail him far too often during the preseason. Things were no better on Monday night, as the Jets were in the backfield on seemingly every passing play. Stafford ended up getting hurt twice in the game due to the poor protection. The run game was also an abject disaster. Lions running backs combined to rush for 39 yards on 15 carries with no touchdowns. Detroit’s offensive line was supposed to be a strength this year after the team invested a high draft pick to grab Frank Ragnow out of Arkansas and brought in Ricky Wagner in free agency. Sometimes it takes a while for new teammates to come together, but things aren’t looking good at all right now. Despite a rough night for Detroit’s offense — things were so bad that fans booed the offense off the field multiple times — one player really shined. The second-year receiver out of Northern Illinois caught seven passes for 114 yards, showing he’s going to be a dangerous playmaker now that he’s a featured receiver. He also gave his offense a second chance with a devastating hit on Jets cornerback Trumaine Johnson that forced a fumble and negated an interception (watch here). Golladay was a silver lining among the dark cloud that was Monday night for the Lions. First, we have to give Stafford credit for being a tough son of a gun. He was absolutely pummeled in this game. Many thought he should stay on the sideline after his second injury, which forced the Lions to go with veteran Matt Cassel for a short while. But he did come back and kept fighting. And for that, we applaud his effort. Everything else that transpired — minus a short period of competence early in the first half — was a whole bunch of yuck. Stafford threw four interceptions on Monday night. One of those was a pick-six hauled in by Darron Lee — the first defensive touchdown for the Jets in 74 games. He made decisions you’d expect from a rookie, and he was way out of sync with his receivers on far too many occasions. There’s no doubt that Darnold was the star Monday night for the Jets. But veteran running back Isaiah Crowell had plenty to do with the team’s outstanding night of offense. Though he only carried the ball 10 times total, Crowell went for 102 yards on the ground and punched in two touchdowns, including a gorgeous 62-yard scamper in the third quarter that erased any semblance of a potential comeback bid for Detroit. This kind of production on the ground is a fantastic complement to New York’s passing game. The Matt Patricia era got off to a horrible start in Detroit right after he was hired. Then rumors emerged that he was already in danger of losing the locker room during offseason workouts. Once training camp and preseason games got underway, fans grew restless as the Lions fumbled and bumbled their way through the exhibition season. Putting it mildly, Patricia’s debut Monday night did absolutely nothing to allay any fears Lions fans have about this job being too big for the former New England Patriots defensive coordinator. The Lions were out-coached, out-hustled, out-schemed and outplayed from the start of the game until the final whistle. The Jets also say they knew what plays were coming before they ever happened. It was not a good look for Patricia and his staff. When setting lineups and figuring out which players to start on your fantasy team this week, it’s likely that Jared Cook didn’t exactly jump off the page. After all, last year he caught a meager 54 passes for 688 yards, eclipsing 100 yards only twice in 16 games. Early during Monday night’s game against the Rams, it became clear that Jon Gruden was going to feature the heck out of his tight end. Cook responded with one of the best games of his career. The veteran hauled in nine passes for 181 yards and was the most productive player in Derek Carr’s arsenal all night long. The Raiders only led by three points at halftime, despite out-gaining the Rams 254-98. You’d think that such a disparity would have shown up on the scoreboard. But alas, Oakland lacked discipline and was docked 145 yards in that first half on 10 accepted penalties. Even worse, Derek Carr was nearly perfect in the first half, but his poor decision to take a shot into the end zone targeting Jared Cook in the second quarter doomed a prime scoring opportunity. These mistakes allowed the Rams to stay in the game, and ultimately the road team seized momentum in the second half and changed the outlook of the entire game. As we mentioned discussing Oakland’s mistake-filled performance, the Raiders had a humongous yardage advantage in the first half. Los Angeles’ offense was way off kilter — Jared Goff only completed four passes, and Todd Gurley attempted just four runs. The defense was getting torched as well, allowing Derek Carr and Co. to march down the field almost at will. Things turned around drastically in the second half. Sean McVay and his coaching staff made amazing halftime adjustments, and they showed up big time, both in terms of overall yardage and on the scoreboard. The Rams out-gained the Raiders 267-126 and outscored them 23-0 in the second half to claim victory on the road. Aside from one really bad decision, which resulted in an interception, Derek Carr had a phenomenal first half. He went into the locker room with 199 yards on 20-of-24 passing, and it looked like the Raiders had Los Angeles’ number in a big way. Then Carr came out in the second half and absolutely laid an egg. He completed just 7-of-14 passes for 89 yards from the third quarter on, and his second interception of the game was truly one of the worst throws I’ve ever seen from an NFL quarterback. He finished with no touchdowns and three picks. It’s crazy how quickly he went from hot to cold. Todd Gurley’s 2017 season was legendary. He led the league in yardage from scrimmage and total touchdowns, and he was the engine that drove many a fantasy football title. Many of those same people who rode Gurley to a championship last year must have been worried after the first half. He only touched the ball five times, after all. Nobody’s worried now. Gurley exploded in the second half and put up an awesome stat line in the end. Touching the ball 23 times, he romped for 147 total yards and a touchdown, sparking a big road win for the Rams to open the season. Loser: Where the heck was Amari Cooper? Jon Gruden was supposed to feature the heck out of Amari Cooper this year. That’s what we’ve been told for months now, after all. On Monday night, Cooper, the former No. 4 overall pick, was practically invisible. He caught one pass for nine yards and was targeted just three times. We get it. The Rams have some outstanding cornerbacks. But Cooper’s supposed to be a No. 1 receiver. You don’t get drafted that high without shouldering the expectation that you’re going to win those battles. Cooper didn’t win those battles on Monday night.